Since I miss tailgating so much, my friend and I decided to host a tailgate themed 4th of July party. I know, I know....I admit I might need a 12-step program for my tailgate obsession. In preparation for the event I was going through my recipes and realized I've never posted a few of them here in the blog. 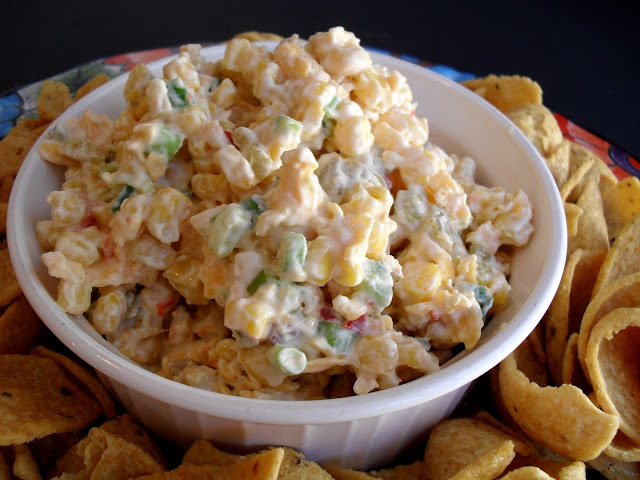 So today's post is for what I consider a tailgate recipe staple, Mexican Corn Dip. Directions: Mix all ingredients and chill. Serve with Frito Scoops or Tortilla chips. For tailgating purposes, I place a bowl of ice under the bowl of corn dip to keep it chilled.